We are saddened to announce the passing of Herb Meyer, a passionate sailor and supporter of the Hansa/Access boats. He passed away last Wednesday surrounded by family and friends. He was 87. Herb first started his racing career in New Jersey when he was 12 years old. When he moved to the Bay Area of San Francisco in 1963, he started racing out of the Belvedere Cove where he kept his boat. In 1980, he followed his boat and moved to Marin where he became active in both the Corinthian and St. Francis Yacht Clubs. Herb raced all over the world including participating in Paralympic races and international races in Canada, Italy, Switzerland, the Netherlands and twice to Australia – in 2001, after winning a trip at the US Access Championships and again in 2004 to compete in the IFDS Single person World Championships in Melbourne. Those words in 1994, spoken by a stranger to Herb shopping for groceries, also changed Herb’s life forever. “I used to be a sailor,” Herb replied. I was enjoying a sail on San Francisco Bay in July 1993. The boat was a Rhodes 50. I was handling the Genoa sheet when I was pulled forward suddenly and I struck my head on a bench causing a spinal cord injury in the C5/6 area. I instantly became a quadriplegic. In the spring of 1994 I found out about the world of Sailors with Disabilities. I was invited to attend a meting of the Bay Area Association of Disabled Sailors (BAADS). Immediately after the meeting, I was invited to go for a sail on an Erickson 27. What a wonderful experience it was to be sailing again as I did not think it was a possibility because of my paralysis. I progressed in my recovery and found out there were nationwide and worldwide organisations providing opportunities to sail and to compete in sailboat racing. I had been involved in racing sailboats for over 30 years prior to my injury and welcomed the opportunity to be on a race course again. The first time that I had a chance to see the Access Dinghies was at the Mobility Cup in Toronto, Canada in 1999. Chris Mitchell and Jackie Kay were making a trip throughout the USA and Canada introducing the boats to various organisations. I was quite intrigued with the capabilities of these boats to introduce new people to sailing whether they be disabled or able bodied. I have had the opportunity to compete in Access Dinghies regattas in the USA and in Australia. I have been very much impressed with the servo-electric system to aid in the handling of the sails and steering mechanism. It was truly a wonderful feeling to be able to sail independently again. I am looking forward to competing in the 2004 IFDS Single Person Dinghy World Championships in Fleet A in which all the competitors will be using the servo-electric system. Consequently this will be the first regatta in which there will be a “level field” for the competition for all participants. Herb was interviewed at the IFDS Worlds. You can see the video here. Herb was instrumental in starting the Hansa small boat program in 2006 and served as Bay Area Association of Disabled Sailors (BAADS) Commodore from 2002-2005. Their annual Herb Meyer Regatta is the premier club event every year. Representing BAADS, Herb continued to compete in local, national, and international regattas for people with disabilities. His ever-expanding trophy collection covered the walls of his home. Herb found not only love on the water but also on the land. Shortly after his accident, Herb met Carolynn Heilig, who came into his life as a caregiver and soulmate. They traveled the world and were together until Carolyn’s untimely death in January 2009 from pancreatic cancer. ​Chris & Jackie enjoyed many visits with Herb and Carolynn at their holiday home in St Petersburg, Florida. Not only was Herb giving of his heart but also of his time. 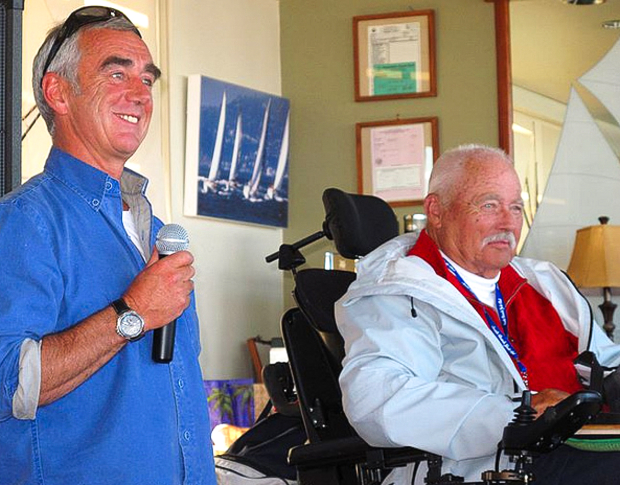 He served on several nonprofit organizations which makes sailing available for those with disabilities and disadvantaged youth including Chairman of US Sailing’s Sailors With Special Needs Committee, the Treasure Island Sailing Center Foundation and Sailability, USA. Herb was perhaps most proud of starting Easter Seals’ Day of Sailing, a fundraiser to raise money for kids with disabilities. BAADS grew and thrived as an organization under his leadership and you have left your windward mark in our hearts. You are very truly a son of this sea now. Thanks to BAADS for the additional information and pictures in this article. Thank you for a thoughtful obit of a wonderful guy. Herb had many abilities and qualities, and started early. He and I were Explorer Scouts in high school and had the pleasure of co-leading a couple of dozen younger scouts from Ridgewood, NJ to Philmont Scout Ranch in New Mexico in June ’52. That was just after college graduation. There’s a photo at http://datix.us/photos/picture.php?/2176/category/76 of him and a burro ready to start hiking.